Freelance artist and designer Russ Papp plays big role developing Victoria’s rapidly evolving visual brand. While his work ranges from landscape and furniture design, to set and costume design for film, as well as even to puppet fabrication and animation work, Russ is also one of the home-grown geniuses behind the kinetic sculptures and funky public art beloved by festival-goers, beer lovers, or anyone with an eye for visual virtuosity in Victoria and beyond. 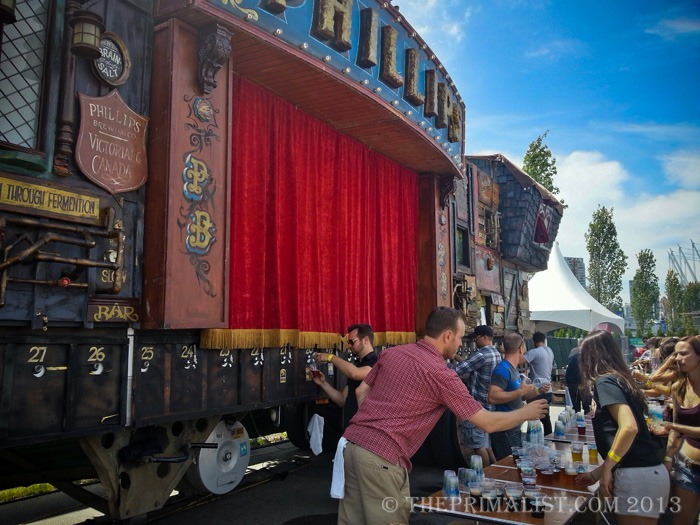 Anyone who has been too Rifflandia will immediately recognize Russ Papp’s most memorable creation, a wonderful 36-foot gypsy caravan-inspired refrigerated trailer with 32 beer taps called the Phillips Gypsy Wagon. The key to his compelling visual style? Russ thinks natural wear and tear is the most beautiful thing in the world and loves to see things with a nice “patina”. Phillips has a distinct aesthetic that is quickly becoming synonymous with Victoria’s fertile creative industries, an eclectic intersection of DIY breweries and the artisans who run them, artists, and entrepreneurs. And Russ’ work is never done. Russ Papp has indeed enjoyed a long relationship with Phillips Brewery – his artist space sits in a trailer in the brewery’s back lot, and he has collaborated with talented local signmaker Chris Dobell (one of the last of a dying breed of signmakers) on many Phillips projects. Russ Papp and Chris Dobell also are sure to incorporate the visual style of Shawn O’Keefe, the graphic designer and illustrator responsible for designing Phillips’ labels since the company began brewing nearly 15 years ago. Russ Papp is also an unmistakable and stylish presence on the streets of Victoria. His vintage blue and red ’51 Chevy dumptruck (the back still lifts to dump) just screams Tectoria. Russ, of course, designed the fantastic Tectoria SpaceBus, a converted 1968 Leyland doubledecker that’s completely street-legal (and fully air-conditioned), and travels to events all over Greater Victoria from its home at 1124 Vancouver Street. For the recent VIATeC Awards, Russ made Dan Gunn a space helmet in just a couple of hours (“He made it for me just because he knew how bad I wanted one,” says Dan) out of leftover foam and a skylight. In short, Russ Papp is creative, always upbeat, and plays a leading role transforming Victoria into one of Canada’s leading creative cities. Thanks Russ! We’re looking forward to your next creation.